An appeal to the heart of God never goes unanswered. It’s always met with goodness, mercy, and grace. So why do we so often behave as if God is a harsh taskmaster? The lover of our souls wants to shower us with His love, and we run in the other direction, afraid of His disapproval. Never enough. Does that phrase ever describe how you feel? Do you wake up and think, “I didn’t get enough sleep”? Do you race through the day and crawl into bed thinking, “I didn’t get enough done”? Never perfect enough. Never thin enough. Never beautiful enough. Never happy enough. Never enough. Whose voice is this? Let me tell you emphatically, it is NOT God’s. God looks at you with kindness, and His heart fills with pride. This is the good kind of pride. It rejoices in the wonder of who you are. He says to you, “You have been given fullness in Christ! You are complete in Christ!” (Colossians 2:10). So who is creating these expectations? Is it possible that we have heard what God desires from us, and then added our own expectations and those of others? Could it be that the feeling of being overwhelmed and inadequate is coming from trying to do things that God hasn’t called us to do? What means the most to God? Is it an impressive resume of volunteering, our accomplishments at work, or the cleanliness of our homes? It’s none of those things. What God cares about is how we love. That’s how He measures success. When the voice whispers, “You’re not enough,” speak the words, “I choose love.” I choose to stand under the shower of God’s love and just soak it up. I choose to be measured by God’s love for me– and it’s unconditional, limitless, and steadfast. I choose God’s love instead of perfection, love instead of expectations, love instead of a never-ending rat race of busyness. I won’t get all the things done today that feel so important to me. 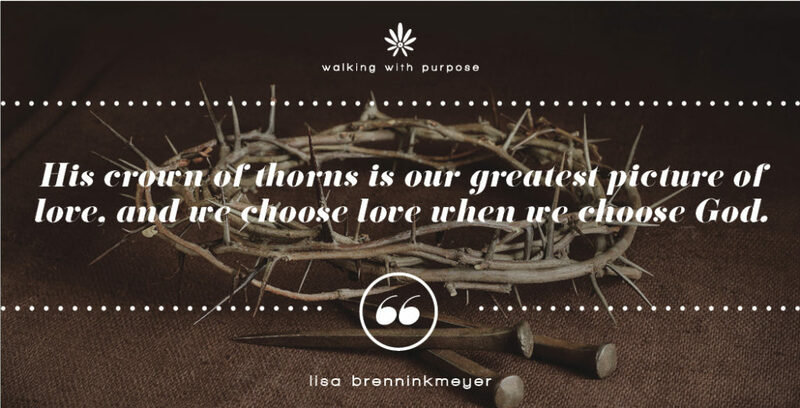 Instead of giving into feelings of discouragement, I’ll choose to be defined by love. I’ll choose to return God’s love by admitting that I don’t have nearly as much control over things as I sometimes imagine. Then I’ll confirm my love for Him by telling Him I’m glad that He’s got it all under control. I don’t know what’s going to happen, but I’ll give it all to God as an act of love. As I fill up with His love, I’ll ask Him to let it overflow into the lives of those around me. On my own, I’m not enough. But “Christ in me, the hope of glory”…now that’s a different story. Praying that you experience a February full of awareness of how crazy God is about you and choose love. This blog post originally appeared on the WWP website in February 2013.